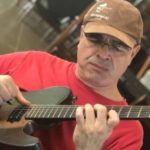 In the second of this video series M Arenas covers arpeggios and applications over diatonic progressions (in Major, Harmonic Minor and Jazz melodic Minor), blues progressions as well as minor blues progressions. These arpeggios are all found in a variety of genres in music and are used by great artists such as George Benson, Frank Gambale, Tal Farlow, John Petrucci, Yngwie Malsteen, Shawn Lane, Al DiMeola, Larry Carlton and more. Each section is divided into chapters and the following topics are covered in order. The purpose of this video is to complete knowledge of most arpeggios to the 13th. All the arpeggios given have been formulated for use with Sweep Picking or with Hybrid Picking technique.